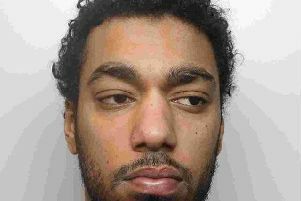 A jury has retired to consider verdicts in the trial of two men accused of manslaughter over the death of a man during a disturbance at a taxi rank in Leeds city centre. Leeds Crown Court has been shown footage of the moment Terry Bailey collapsed in the road outside Leeds railway station in the early hours of August 29 last year. Daniel Goodall, 42, of Poplar Mount, Bramley, and Jamie Loftus, of no fixed address, both plead not guilty to manslaughter. Mr Bailey, 39, was pronounced dead less than an hour after the incident which happened at around 12.30am. The court has heard the three men knew each other and the attack took place after a dispute over drugs. Opening the case, prosecutor Simon Kealey, QC, described how Mr Bailey and the defendants were involved in an argument as they walked to a taxi rank beside the station. Mr Kealey said the defendants got in to a taxi and it was their intention to go to Beeston in order to buy and take drugs. The court heard the defendants then got out of the cab and Goodall punched Mr Bailey before pushing him away violently. Mr Bailey then staggered into the road and collapsed. Both defendants have given evidence during the trial. Goodall told jurors he had been trying to act as a peacemaker in an argument between Mr Bailey and Loftus. He said Mr Bailey had been his friend since school and he would not want to hurt him. Goodall denied causing the fatal injury. He said went to push Mr Bailey but was not sure if he made contact. Loftus said he threw punches as he feared he was about to come under attack after spending ten minutes trying to get Mr Bailey to leave him alone. He said: "I remember him (Mr Bailey) saying he wanted to hurt or kill me."